Save the Date Full Color Circle Magnets – Most of the save the date magnets are shaped square or rectangular because people still feel that they look authentic. 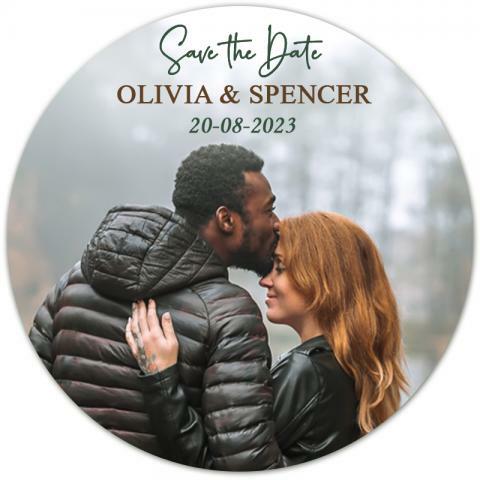 The circular shaped save the date magnets are also preferred by many couples because they feel that it offers them plenty of customization space against their investment. A save the date full color circle magnet can be personalized with suitable images and wedding information. You can either send us finished art or your basic information in the form of images, personal information. Our graphic designers will seek your approval on the design proof within 24 hours and the product will be dispatched within next 2-7 working days.